Microphone Stability: 1912 is a microphone desk stand that will support your microphone and give it the stability you need. The desk stand has a cast base for stability which will fit the majority of microphone clips. Robustly designed: The microphone desk stand is sturdy & stable to support your microphone. The rubber feet are meant to provide some acoustic cushioning as well. you can also use it with 1943 microphone clip. With a standard 5/8" male thread, it stands approximately 60mm tall and securely holds the microphone on any flat horizontal. 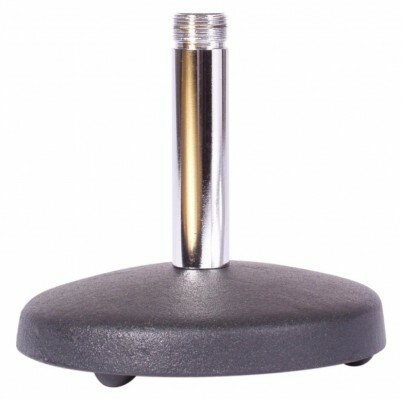 Heavy sturdy 100mm(w) metal base with rubber feet.